Five years ago we embarked on an exciting new journey, we starting the building process and built our first home. We had been together for over five years, but had never actually lived together. Instead, we stayed in both of our family homes and saved the money we would have had to cough up for a hefty rent (paying off someone else’s mortgage just wasn’t an option for us). We spent weeks deciding on what we wanted, where did we want to live? What type of home did we want to build? How much could we spend, or how much would the bank allow us to anyway? The entire process was very stressful and seriously overwhelming. Making all these life changing decisions and knowing it would leave us with a seriously large debt and responsibility was majorly daunting. At aged 23, paying a mortgage each week, lots of every day bills as well as having to put food on our own table was not really what people our age were jumping into with open arms. Despite the initial freak out stage, Ben and I still desperately wanted to move in together so we could start living our lives in a “normal” relationship. Having sleep overs at his parents and at my Grandparents wasn’t really cutting it towards the end. We finally chose our block, designed our house plan and within six months of the slab being poured, we were living in our very first abode. I loved our first home. The first few months I would clean every inch of the house on a Saturday morning, with the music blaring. I cooked Ben delicious meals in my first kitchen, Ben mowed his lawn like a proud home owner. We both embraced our new roles of “adults” and really appreciate what we had created. The view from laying in our master bedroom. 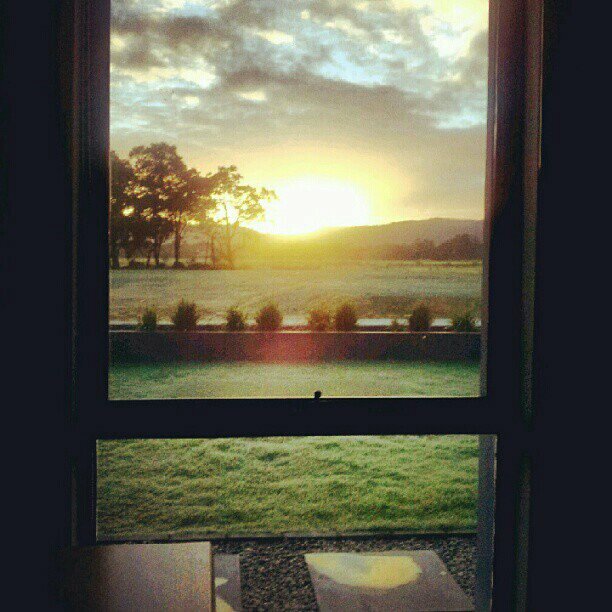 I loved watching the sun rise from this very window. After the first year though, I started imagining things differently and wanted to start making huge changes. Could we install a pool? What would the room look like if that wall was knocked down or if doors were installed on there? Could we extend the basins or change the tiles? I was itching for change and nothing I styled or changed was filling my cravings for something bigger and different. It was decided; instead of changing the entire home, we chose to build again. Build something we loved even more with the changes we knew we wanted. We created some amazing memories in our Kandimak home, memories that will never fade, those moments have molded us into who we are today. Without this first home and all the experiences that came with it, then we wouldn’t have gotten to where we are now. Our first home is now up for sale, click on the link below to see some recent photos.